Prepare to be amazed as Florian “Venom” Kohler uses phenomenal skill and unprecedented technical precision to perform revolutionary pool trick shot magic. These shots seem impossible, but not to Florian. Don’t blink! You have to see it to believe it. PoolDawg and Florian have had an ongoing partnership for over a year now and we’re always excited to show his fans new material! Florian is an 8-time World Artistic Pool Discipline Champion, a 6-time Guinness Book World Record Holder, and his YouTube page, Venom Trickshots, has over 600,000,000 views! There is a lot to come in the future with this partnership. In the meantime, check out our series of Billiard Tutorials and the incredible Multi-Table Trickshot video! Do you want to spin it like Florian? 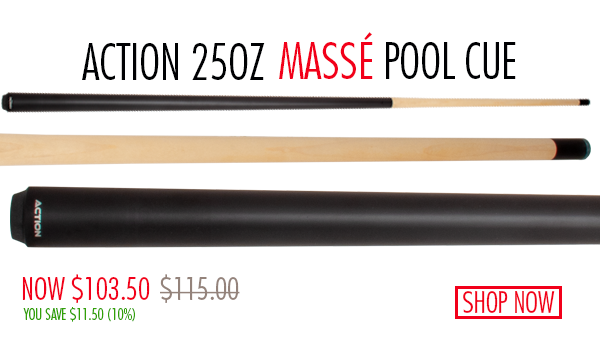 JUST RELEASED: You can now purchase your very own massé cue that won’t break your bank! This 25oz cue from Action is specifically designed for massé shots with a short, stiff shaft (46.5” total length) and a 14mm soft tip. What makes this truly unique is that it is the first massé cue on the market that won’t cost several hundreds of dollars. Now you can get the equipment to attempt these insane shots at a reasonable price! AND make sure to buy some of these cloth shields too, or you might as well order more table felt while you’re at it! With practice, maybe you can become a trick shot guru as well. Best of luck!